1984 is here … 13 years early…. The following call has been issued to peace activist groups. 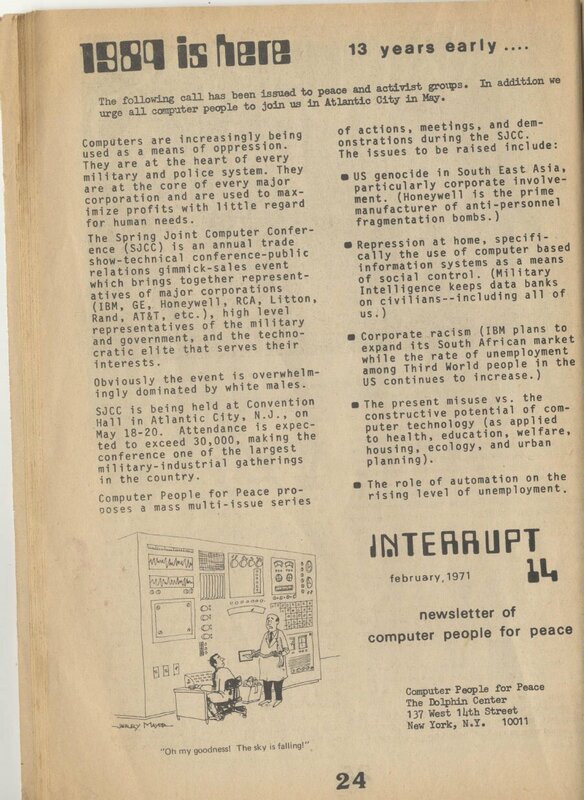 In addition we urge all computer people to join us in Atlantic City in May. Computers are increasingly being used as a means of oppression. They are at the heart of every military and police system. They are at the core of every major corporation and are used to maximize profits with little regard for human needs. The Spring Joint Computer Conference (SJCC) is an annual trade show-technical conference-public relations gimmick-sales event which brings together representatives of major corporations (IBM, GE, Honeywell, RCA, Litton, Rand, AT&T, etc. ), high level representatives of the military and government, and the technocratic elite that serves their interests. Obviously the event is overwhelmingly dominated by white males. SJCC is being at Convention Hall in Atlantic City, N.J., on May 18-20. Attendance is expected to exceed 30,000, making the conference one of the largest military-industrial gatherings in the country. The present misuse vs. the constructive potential of computer technology (as applied to health, education, welfare, housing, ecology, and urban planning). The role of automation on the rising level of unemployment.